The weight of expectation following a perfect record must be extremely heavy. Susanne Sundfør finds herself in that position after 2015’s breathtaking masterpiece, Ten Love Songs. Instead of making another theatrical record full of cinematic synth pop and orchestral ballads, Sundfør has stripped things down drastically for her follow-up. Music For People In Trouble is her most intimate release yet. A bold sidestep like this is a move some of the best artists have made. After achieving a similar level of perfection with Homogenic and Vespertine, Bjork deconstructed her sound and headed in a more oblique direction on Medulla. Talk Talk did similar masterful reinventions on Spirit Of Eden and Laughing Stock. Sundfør’s development of electronic sounds on Ten Love Songs felt like a natural evolution after 2010’s The Brothel and 2012’s The Silicone Veil (with last year’s Röyksopp collaboration, ‘Never Ever’, acting as a victory lap). Here, she’s created a very different kind of record, and one that’s just as special. There are indications that this isn’t going to be another Ten Love Songs from the outset. A tender acoustic guitar opens up the album on ‘Mantra’. You can picture Sundfør singing this simple ballad to the moonlit sky as she laments, “I’m as empty as the earth, an insignificant birth, stardust in a universe, that’s all that I am worth”. There’s echoes of Long Gone Before Daylight by Cardigans as a slide guitar provides the song’s beautiful coda. Last year’s single, ‘Reincarnation’ has another minimal acoustic backing and hushed vocal from Sundfør. The bare instrumentation totally exposes the loneliness in her voice. These songs make a good companion to Goldfrapp’s Tales Of Us. Sundfør swaps guitars for a piano on the haunting, ‘Good Luck Bad Luck’. Just when you think the song has come to a premature end, it returns with an unexpected jazz interlude that places you into a smoke-filled jazz club from the 50s. The musical detours increase on the otherworldly, ‘The Sound Of War’. It begins with a sense of calm that recalls ‘Trust Me’ and ‘Silencer’ from Ten Love Songs. The difference is that those songs eventually lift off with lavish and elaborate arrangements. Sundfør sings about “the buzzing of the drones” in ‘The Sound Of War’ — and they appear four minutes in as droning synths. Those eerie drones turn into Eno-styled ambience for the last minute. The title track follows, suddenly bursting into life with sci-fi sound effects you might find on Broadcast’s more unconventional moments (or even their abstract 60s influences such as White Noise). The chopped up spoken vocals and sound effects recall Yazoo’s ‘I Before E Except After C’. The song plays out with another switch up of acoustic guitars. The lack of commercial structures goes back to The Brothel, but this time it paints a picture that’s more vivid and unsettling. The striking piano ballad and second single, ‘Undercover’, features the album’s most memorable melody. It’s not an obvious single in the same way as ‘White Foxes’, ‘Fade Away’, and ‘Delirious’. The despair that resonates over the album continues as she sings, “don’t trust the ones who love you, cause if you love them back, they’ll always disappoint you, it’s just a matter of fact”. ‘Undercover’‘s climax is powerful because a choir complements her gorgeous longing voice, though it’s understated in comparison to the huge crescendos of some of her previous work. ‘The Golden Age’ is one of the rare times Sundfør uses electronics on the record. It would fit neatly onto ABBA’s best album, The Visitors. Music For People In Trouble is brilliantly sequenced as ‘The Golden Age’ flows into ‘Mountaineers’, which is an atmospheric finale. After a dark Scott Walker-styled intro courtesy of John Grant, a rare instance of light appears in the song’s outro. The uplifting strings and backing vocals blend with Sundfør’s devastating vocal, creating one of many spine-tingling moments. This is music at its most unpredictable and thrilling. Sundfør has followed perfection with an equally brilliant album. The sparse instrumentation and bleak lyrics are part of her captivating journey into new territories, where she continues to create enriching music. She does it all with no sign of compromising. Music For People In Trouble is another exceptional masterpiece from the best songwriter around. Music For People In Trouble is released on 8th September through Bella Union. Excellent review. Gotta buy it now! 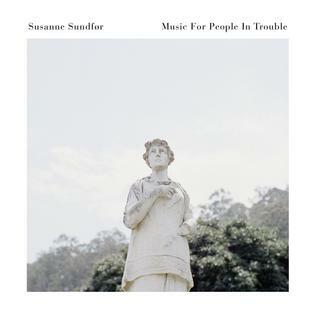 As Jonathan knows I loved the last Susanne Sundfor album, and I thanked him for helping me discover it. “10 love songs” really is a great album, well worth checking out despite your comment, but this is a steaming turd of pretention. how anyone cannot see that and give it a 10 is beyond me.